Children’s Get-together in Cassano D’Adda (Italy), December 7, 2014. This year, the Servant Sisters of the community of Brignano (Italy) are helping the Parish of the Risen Christ in a nearby village called Cassano D’Adda. We are in charge of two groups of kids preparing for their confirmation and three groups preparing for their first communion. During Advent we decided to prepare a retreat for all children aging from 8-11 to help them prepare for Christmas. The retreat took place on December 7, the eve of the feast of the Immaculate Conception. There was a large group of more than 100 children. 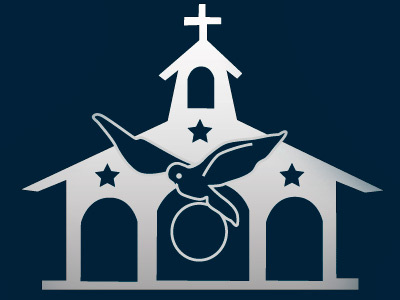 The day began with the children's mass at 10:30 a.m. in the parish of the Risen Christ. After the mass, we divided the children into four groups. Every group did an activity that had to do with the four dogmas of the Blessed Virgin Mary. The groups rotated through the activities discovering the names of each of the dogmas and then they listened to a short explanation of the mentioned privilege of Our Lady. With the help of the catechists, everything was explained in a clear way so that the children could understand. After the game, we had lunch with the yummy sandwiches that each child had brought from home. 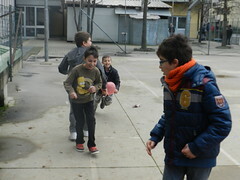 Then we gave the children free time to run and play amongst themselves. Then we had a game to find all the figures of the Nativity scene. Divided into teams, the children overcame various tests in order to obtain the different characters and set up a true Nativity scene. They found all the characters, all except... Jesus! They had found all, but the most important person of the Nativity was missing! When the kids realized that Jesus was missing they asked with concern: but... where do we get baby Jesus? Hmmm... There was one last clue that would take them to the church, where they would find baby Jesus. There, we had some time of adoration where they could meet face to face with Jesus. The parish priest, Father Antonio, had the Blessed Sacrament exposed. 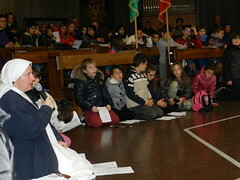 The sisters helped the children to pray with songs and prayers. In this final moment of adoration, we were also joined by many of the parents of the children who had attended a meeting that we had with them while their children participated in the game. They all finished the get together very happy of having learned more about Jesus and Mary.